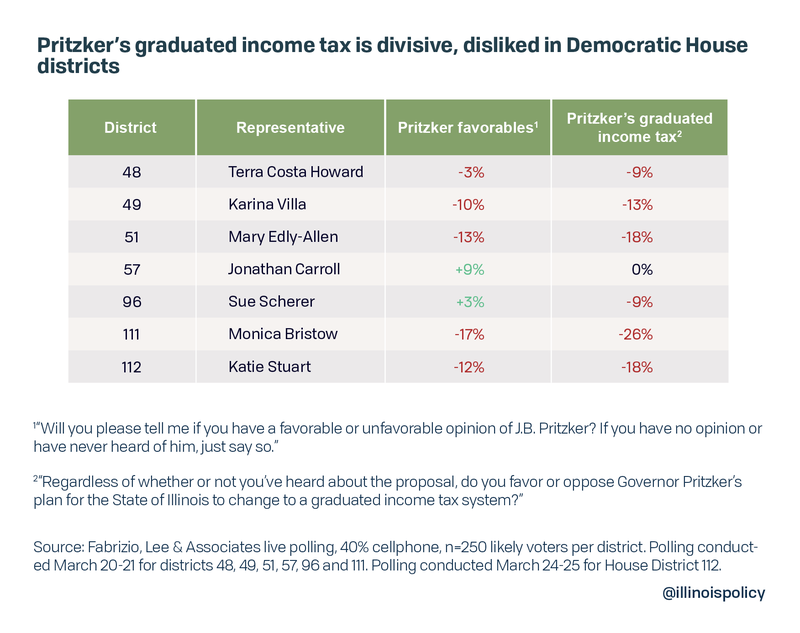 Notably, respondents who said they were aware of Pritzker’s tax plan were more likely to oppose a constitutional amendment allowing for a graduated income tax. Illinoisans know trading the Illinois Constitution’s flat tax protection for Pritzker’s illusory promise of tax relief is a bad deal. Ultimately, Illinois’ spending and debt habits mean Pritzker’s plan will be a bridge to higher taxes for the middle class. That’s why state lawmakers should reject the governor’s false choice between a progressive income tax hike, a flat tax hike and massive spending reductions. The Illinois Policy Institute’s Budget Solutions 2020 plan offers a bipartisan five-year plan that would balance the state budget while reducing debt and allowing for tax reductions. Full polling details: House District 48 (topline, crosstabs), House District 49 (topline, crosstabs), House District 51 (topline, crosstabs), House District 57 (topline, crosstabs), House District 96 (topline, crosstabs), House District 111 (topline, crosstabs), House District 112 (topline, crosstabs).